Orca vs Yeti sounds like two animals duking it out, but upon closer inspection you’ll see that a duking out is indeed happening, however it’s to claim the top spot when it comes to coolers. If the topic on your mind as you searched for more information online was Orca coolers vs Yeti, then you have come to the right place. We’ll be taking a closer look at the coolers in each lineup to see which ones will suit you best. Here’s a closer look. 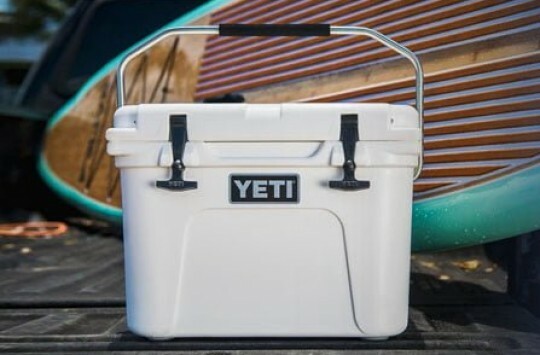 Yeti and Orca are two premium, American ice chest brands built by true outdoor enthuriasts – the Seiders brothers in case of the former and the Cliff Walker in case of the latter. The two companies have been going pretty much head to head, iterating on cooler designs and investing into rotational molding technology with a one goal in mind: to make their products the best insulated coolers on the market. To help you choose a winner in the Yeti vs Orca battle, first let’s go through a brief overview of each brand and their respective lineups. With the Orca cooler lineup you’ll get numerous sizes to choose from, which means that your next party, outing or event will be able to handle crowds of most sizes. What kinds of sizes? Glad you asked. You’ll be able to find Orca coolers in sizes of 20, 26, 40, 58, 75 and 140 quarts. 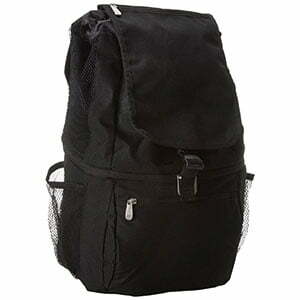 UPDATE: Orca also offers some of the best soft coolers on the market: Orca Backpack Pod and Backpack Podster. Check our review here. to-center . . . . . .
14" x 10" x 11"
16.5" x 12.25" x 10"
19" X 11.75" X 11"
18.5" x 12.3" x 13.375"
27.5" x 12.375" x 12.625"
31" x 15.5" x 15.6"
40" x 23.5" x 20.875"
Each and every cooler that Orca produces is one hundred percent American made. With a lifetime warranty you can be sure that you are only getting quality products. And finally a truth in sizes can be found. When Orca states a specific size, then you can bank on it being that size. Unlike other brands where the stated quart size is actually much less. 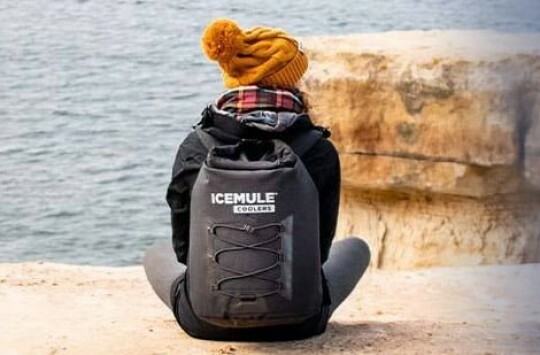 In Orca, you will find a cooler with massive ice retention times. Orca manufacturers have stated that ice can last up to 10 days when properly prepped for use. Want to learn more about other big cooler brands? Then check out our Pelican vs Yeti article. The Yeti Tundra series also comes in a wide variety of sizes. Sizes small enough to hold 20 cans, and sizes large enough to hold 25 times as much or 268 cans. You can also find a smaller personal sized cooler in the Roadie, if you fly solo a lot. 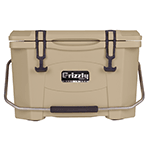 A rotomolded design, strong latches and a field test unlike any other – Grizzly Bear approved, you will find a Yeti very much to your liking. 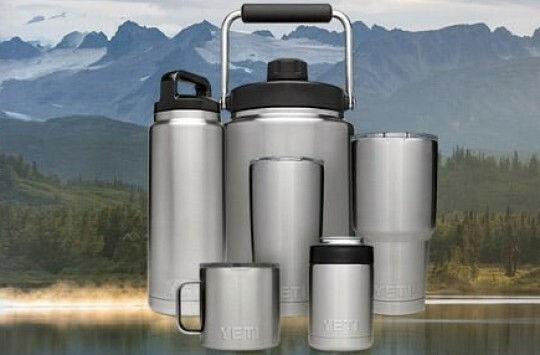 PermaFrost insulation means that you will be getting top of the line ice retention when you decide to chill your food or beverages with the Yeti Tundra. 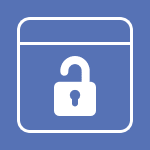 A ColdLock Gasket ensures that hot air stays out and cold air stays in the cooler as much as possible. The Yeti Tundra series also offers a hinge system that they say will never fail. Throw in non marking rubber feet, and this version of the Tundra is ready to go from the back of the truck, to the boat and back home without slipping and sliding all over the place. Ready to see more information on the Yeti and other coolers? 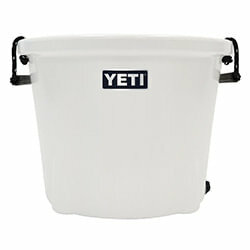 Then check out this Yeti coolers for sale article. In some cases, you may want to flip a coin when it comes down to choosing between these two big names in the cooler and outdoor niche. If only it were that easy. 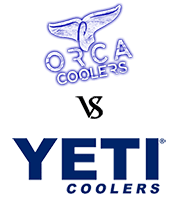 Here is a look at these two a little closer to help you decide – Orca Coolers vs Yeti Coolers. When it comes to coolers, size does play an important role. While some demand and call for larger sizes for events, outings and adventures, there may be times when a smaller, more convenient cooler is in order. 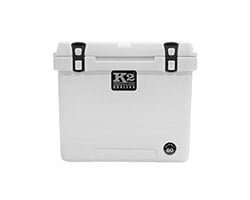 In the case of the Orca line, you will be able to find coolers as small as 20 quarts, and as large as 140 quarts. What some users have mentioned is that the size you are shown is the actual size that you receive. Meaning, when Orca says 20 quarts, then your actual usable and measurable space in that given cooler is 20 quarts. In the case of size as it pertains to the Yeti, you could go as small as a Roadie, which holds 14 cans of your favorite beverage, or choose from an even larger variety of sizes in the Tundra line (pictures below). As mentioned above, coolers here have a starting capacity as small as 20 cans, and sizes large enough to hold a much larger size at a shade over 11 cases of cans. What someone says is one thing, what you can come to find is another. For this section, let’s not take a look at what the manufacturer says ice retention times are. Instead, let’s have a look at what actual real world users are reporting. After four days of use, and placing ice in the Orca, one user took its actual temperature. No, not with any normal device but rather with a IR handheld thermometer. You can’t get accuracy any better than that. The sidewall and contents stayed at just above and just below 40 degrees Fahrenheit. 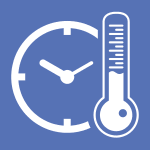 Given that most refrigerators fall close to that temperature, holding a temperature that low over the course of a few days really speaks to the ice retention times. Now let’s look at the Yeti. After three days one user reported still having ice in the cooler, however most of the ice had melted. The user reported an expectancy that at day four there would still be ice to be found. 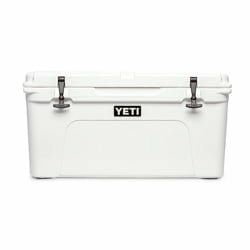 Another user reported the ability of the Yeti to hold cold temperatures, mentioning that the cooler works great at holding contents cold for several days at a time. There may be times when you will need to leave your cooler in areas where other campers are, or out in the open where predators may be able to get into them. In this case, you will want to be able to secure the cooler. With the Orca you’ll find drilled out corners lining up the lid with the rest of the body, allowing you enough room to place two locks of your choice, one at each front corner. The Yeti Tundra line also allows you this type of locking area when it comes to security. It’s been a difficult decision for us to make as in fact, you really cannot go wrong with either one of these coolers. You will be getting superior quality, longer ice retention times as well as features you won’t find on cheaper coolers. However, If were to choose between those two today, we’d have to go with Orca Coolers. The main reason is the value for money. While both brands offer quality ice chests, it’s the Orca who’s managed to built an amazing product that is slighly less expensive than its rival (in terms of price per quart). We also prefer Orca’s approach to sizes – their small coolers felt a bit easier to carry. Some users will also appreciate fact that Orca coolers come in more colors. The bottom line is that the differences between Orca and Yeti are minor, and although our personal choice in this battle would be Orca, the debate of Orca vs Yeti is one that you will win, either way you choose to go. 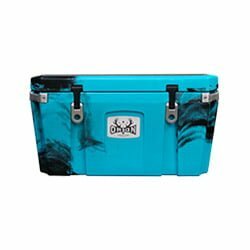 Where Can You Get Orca Coolers Or Yeti Coolers? There are many places you can get one of these top coolers. You can go directly to the manufacturer’s website, an official dealer or Amazon. As you may already know, Amazon is a preferred shopping destination not only for its cheaper prices on a lot of items, but also the deals you can get on shipping. Ready to get an Orca? Get it here on Amazon, click here now. Want a Yeti instead? No problem, click here now. Orca vs. Yeti – Vote Now! Now it’s time for you to take it in your hands and vote! It’s a heated debate and we need your help to find the winner of this battle. Simply choose one brand and find out what others went for. confirmed my thoughts 😀 I would buy Orca even if was only a little worse even because its made in America. Is the handle on the Yeti removable? The Rope handles are removable. As for Yeti Roadie, we don’t recommend removing the handle, because the handle stays in place through tension. However, if you remove it, you might want to put newspaper or a magazine between the handle and the Roadie to avoid scratching it! Hope it helps! Last October I filled our Orca cooler with frozen meat and started our winter pilgrimage to Georgia. The trip took six days due to several stops along the way and when we arrived and began loading the meat into our boat freezer, we found that 60% of the meat was still frozen and the rest was not quite thawed but less than frozen. Packing with little wasted space accounts for much of the meat being frozen but superior insulation and lid seals have proved to be a significant factor. I’m just purchased a 58qt Orca in blue. My son bought me a 40 quart Orca for Father’s Day and it’s GREAT ( talk about a nice present ! ) I can’t wait to use it again ! David, if you had to choose, what animal would you want? I purchased the Orca because Yeti is anti 2nd Amendment. I don’t like Orca hinge. Mine is cracked. If you let the top open beyond 90 degrees the stress on the hinge causes it to crack. There should be some sort of a stop or brake. Major design flaw.